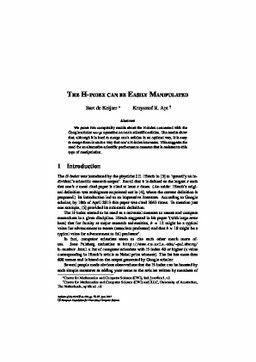 We prove two complexity results about the H-index concerned with the Google scholar merge operation on one’s scientific articles. The results show that, although it is hard to merge one’s articles in an optimal way, it is easy to merge them in such a way that one’s H-index increases. This suggests the need for an alternative scientific performance measure that is resistant to thistype of manipulation. de Keijzer, B, & Apt, K.R. (2013). The H-index can be Easily Manipulated. Bulletin of the EATCS, 110, 79–85.